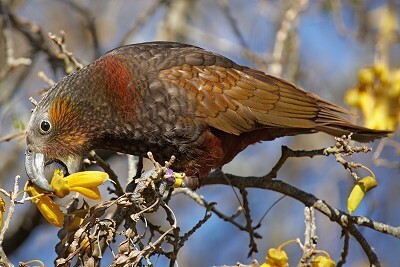 Like the Kea, these parrots are named after their calls. Kaka's are strong fliers which inhabit native forest on main and larger coastal islands. The South Island (N. meridionalis ) is brighter coloured than the North Island (N.m. septentrionalis ). Male's bills are more deeply curved. They dig in dying wood for grubs and eat fruit, leaves, nectar and insects. They nest in hollow trees and lay 4-5 white eggs on pulverised wood. In Arthur's Pass, you'll see or hear them in the Waimakariri Valley above Turkey Flat, or at Carrington Hut area. Their call is a strong booming "hoot" type sound, you've got to use your imagination to hear "kaka" in the call.